Science has the potential to address basic human needs while providing revolutionary economic growth. One of the most fundamental measures of quality of life is access to clean water. Today two thirds of humanity face water stress at some point during the year and one in 10 do not have clean water. As populations grow so will the demands for drinking water and agriculture. At the same time climate change will impact available resources. Our capacity for consuming Earth’s resources must be outpaced by our potential to produce innovative answers. Science is a key to hope—and solving grand challenges, whether in water purification or in other areas such as energy generation and storage or healthcare, and has the potential to address basic human needs while providing revolutionary economic growth and sustainable development. Addressing these challenges requires scientific breakthroughs in a wide range of research areas, with a common requirement for design and development of new materials that meet increasingly complex performance requirements. Our ability to manipulate materials has characterized the ages of civilization through stone, bronze, iron, and silicon. The trial and error approaches of history don’t equip us to tackle the complex polymers, proteins, and nanostructured alloys we work with today. Thankfully, recent years have brought us significant advances in the ability to design and develop the advanced materials required to solve big technology challenges. Increasingly complex materials demand sophisticated tools for both characterization and modelling which forms the basis for understanding that allows us to design new materials with specific properties in mind. Around the world nations have invested in x-ray facilities such as the NSLS-II at Brookhaven National Laboratory in the US and MAX-IV in Sweden to enable the study of material properties and functions with nanoscale resolution. Neutron sources such as the Spallation Neutron Source at Oak Ridge National Laboratory and the European Spallation Source being built right next to MAX-IV use neutrons to explore the fundamental properties of advanced materials. Supercomputers couple the information on structure and dynamics obtained from experimental work with the models needed to inform design and synthesis of new materials. There is a global push to extend performance to the exascale further enhancing capabilities for modelling and simulation as well as data analytics. One challenge for scientists is how to use these new tools to more rapidly perform the translational research needed to solve critical challenges such as the need for potable water. In many areas of the world, potable water is a scarce resource and every minute of every day, a newborn baby dies somewhere in the world because of an infection caused by a lack of clean water and an unclean environment. Researchers around the world are pursuing multiple approaches to desalinating seawater into potable sources of drinking water, including vacuum, multi-stage, multiple-effect, vapor-compression distillation, and reverse osmosis (RO). RO is commonly used for a portion of the desalination process and has greatly reduced the high energy and capital costs associated with some other desalination processes. The key to the RO process is the membrane, a thin film that separates water with higher salt content from water with lower salt content. The membrane must be able to survive having large pressure differences across the two sides, must allow rapid water transport while impeding salt transport, and must resist fouling or becoming clogged by the salts. One major limitation impacting these different approaches to desalination is that many places in the world do not allow the disposal of the liquid waste and require the waste salts to be solid for disposal. This requires another step in the desalination process, increasing overall cost and complexity. 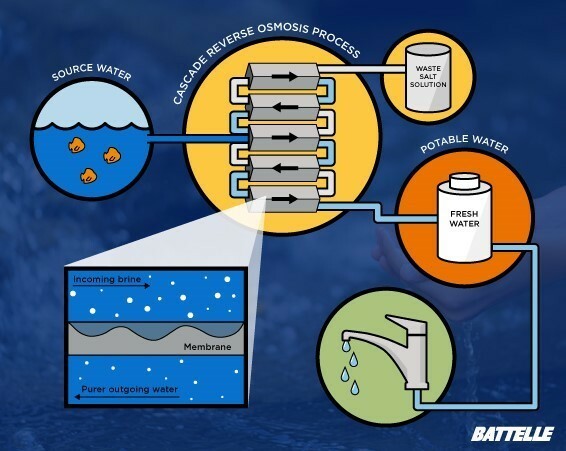 Reducing the complexity of the overall desalination process can be achieved either through improvements to the membrane technology used for RO, or through improvements to the underlying RO process, such as with a cascade RO process being developed by Battelle which combines multiple RO stages with novel methods to use the intermediate waste water to significantly reduce operating pressures and energy input, and achieve recoveries two-to-three times higher than conventional RO processes. It is up to the global scientific community to provide the world with affordable, available clean water for continued positive growth. And it’s clear that advanced materials will need to be continuously developed in order for this to occur. The fundamental understanding of how the structure and dynamics of materials determine the properties that make them useful through government investments in research and universities and national laboratories is facilitating a new age of materials by design. This will enable companies and NGOs to deploy technologies such as cascade RO that address humanity’s pressing needs.